If you're anything like me, you're always looking for new books to read and more readers who are as fanatical about reading as you are. While I've recently been able to drag coax a few people I know in person to read some of my favorites, the more the merrier! 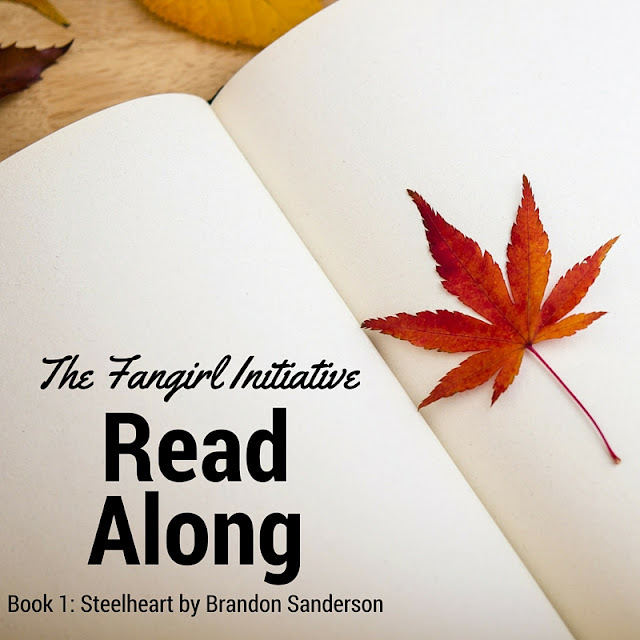 So, I would like to introduce you to the first installment in The Fangirl Initiative Read-Alongs! Every two weeks (as for now I'm a biweekly contributor here at TFI), I'll toss up a blog post here with my thoughts/reactions for the assigned chapters of the book I'm currently using for a read-along. Y'all are welcome to discuss the chapters with comments on the post and our Facebook page, as well as participating in the challenges I issue (and will occasionally participate in), of which I hope there to be one a month. There won't be any prizes or anything (boo! Hisssss! ), but we should have a good fun time anyway! The Reckoners series, of which Steelheart is the first book, is one of my favorite series by Brandon Sanderson. (My all-time favorite, which I will probably do a read-along of at some point, is his novella Shadows For Silence In the Forests of Hell. Seriously awesome.) Steelheart has super-villains, shadowy assassins, and a quirky main character, all wrapped up in one of Sanderson's traditionally twisty story plots. Fangirling aside, Sanderson is a fabulous writer and one of my fiction-writing heroes. So please, join along with me as I re-read Steelheart, and I hope you enjoy it as much as I do! For the next two weeks, read Chapters 1-10 of Steelheart. I'll post a reactions/thoughts post on Sunday, June 26th. See you then! And because it has one, here's the book trailer!